A special brew to commemorate WBC’s 14th anniversary, this Belgian Strong Dark Ale is a rich, dark strong ale, brewed with German and Belgian malts and fermented with Belgian Trappist yeast. It has a spicy, phenolic aroma with generous malt character and drying finish. This American Pale Ale features the single use of the French hop – Aramis. It’s a brand new hop variety that lends a delicate herbal, lemongrass, green tea flavor and aroma to this pale ale. Our Imperial Stout, BDA is strong, dark and rich with dark fruit & malt flavors. Named after one of our brewers (we’ll let you guess which one). Offical 2015 Cleveland Beer Week collaboration beer, BelgOHio was brewed with pale and pilsner malts and small bit of abbey and wheat malt. Copiously hopped with American and Australian varieties and double dry-hopped. Fermented with Saison yeast to lend a spicy Belgian character. The original 14th Anniversary beer of our brewpub, Brute’s Quad is malty and rich with plum, raisin and other dark fruit flavors and aromas. Each sip offers a complex and robust taste and finishes with just a hint of dryness. This Belgian-style Dark Strong Ale is best served in Belgian stemware and slightly chilled. This west-coast style IPA boasts a unique fresh hop character that comes from the use of Australian Galaxy hops. Another classic coffee porter from Willoughby, this one with hints of caramel. A coffee porter with the rich aroma and flavor of vanilla and caramel that reminds you of Creme Brulee. Our fall lager, this Oktoberfest is smooth, malty and perfect for enjoying the changing seasons. An English Brown ale brewed with 20% oats and fermented with English yeast. This robust porter is dark, rich and roasty, which draws it flavors from the roasted malts used to brew this beer. With a mild hop presence and a creamy head, this porter is creepily smooth! Our version of an American Brown, Hopfull is a rich, malty beer with a 7.3% abv. We add additional hops at all stages to give it a hoppy aroma and flavor. This Black IPA is jammed with hop flavor from Simcoe and Ahtanum hops with the addition of rye malt to add a smooth finish. Our Kaiserhof Kolsch, infused with a fresh, bold locally roasted coffee. A light colored German ale, brewed in the style of the famous beers of Cologne, this Kölsch-style beer features a fruity aroma and clean taste with light bitterness. Last Stop Stout is our version of an Irish dry stout, with a roasted malt aroma and flavor, and clean, dry finish. An American Pale Ale in of the West Coast variety, Little Dipper features a strong hop flavor and aroma like an IPA, but the lower bitterness and alcohol of a pale ale. At only 4.3%, you can enjoy more than one. Our newest IPA, Moondance is a a golden-colored, hop-bomb with light malt flavors that allow the juicy hops to come through. Our new Oatmeal Stout features a roasty, malty stout coupled with the addition of Oat Malt that adds a slick mouthfeel. A moderately hoppy pale ale, showcasing the Ahtanum hop. Light gold in color with milder hop bitterness. Brewed in collaboration with Society of Northeast Ohio Brewers homebrew club to celebrate the club’s 25th anniversary. This is a kettle-soured brown porter with a tart pucker and low roast/chocolate flavor. An absolute classic. 225 lbs of pumpkin add to a creamy body mixed with subtle hints of pumpkin spice! This beer has been called pumpkin pie in a glass! Rosana is a malty red ale made with the addition of rye malt that gives it a spicy malt finish. Our take on the American Pale Ale style, this light amber ale has a strong malt backbone with just enough bitterness to provide a clean, crisp finish. Brewed with traditional English malts and American hops, this versatile style pairs well with all types of food and cheeses. A 3.5% session ale, this dark copper ale boasts a strong malty profile with slight roasted malt notes. Brewed in the style of a Scottish 60 Shilling ale, we brewed this ale to be an easy drinking, pub ale. Brewed with home-brewer Justen Pelton, She’s Soo Heavy is the Scottish Wee Heavy that won the 2013 King of the Mountain Homebrew Competition held in May at WBC. A strong, dark brown ale, this beer has a lot of malt and toffee flavors with just a hint of warmth from the alcohol content. A malty Winter warmer destined to keep you warm on those cold nights. A strong brown ale in the English style, with a special yeast-driven character to give it a unique taste. A special Belgian-style saison for the Spring, our Spring Saison features a complex malt bill with Belgian yeast that provides a unique character with a drinkable quality. We’ve given this beer an American touch by featuring US hops. Named after a Bavarian saint, this Weizenbock combines the banana/clove highlights of a German hefeweizen with the dark malty notes of a bock beer. Our newest IPA, Supernova, is a Double IPA with copious amounts of malt and hops which bring it to 10% abv and 105 IBUS. We used a lot of American hops including Centennial, Columbus, Simcoe and Cascade. A decidedly hop-forward American Pale Ale, with a radiant golden color. Crisp and clean with lots of hop aroma and flavor, but lower bitterness. This American-style Blonde Ale is an all-malt beer that is light in body and in color, yet full of flavor. At 4% alcohol by volume, it’s very drinkable and pairs well with all types of food, especially salads and fish. It’s the perfect beer to start your craft beer experience. Our Christmas spiced ale, Wenceslas is a strong, brown ale with rich malt character to which we add an assortment of seasonal spices to make this Cleveland-style beer. Our Irish Red Ale, Wild Irish Red boasts a malty flavor, deep red color and slight hint of roasted malt. Perfect with any meal. Our German-style Hefeweizen, brewed exclusively with German malts, hops and yeast. An unfiltered, cloudy wheat with banana, clove and phenolics that will make you feel like you’re in a Bavarian Biergarten. 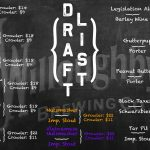 The original Willoughby Wheat is back! Not a true hefeweizen, this is a blonde ale that has just enough wheat malt to lighten the body and make this beer an easy drinker.